Greensburg is a perfect balance of trendy and refined. The City’s Cultural and Shopping Districts present their offerings in a seamless blend of urban architecture, enhanced streetscape, artistic flair, and unique experience. 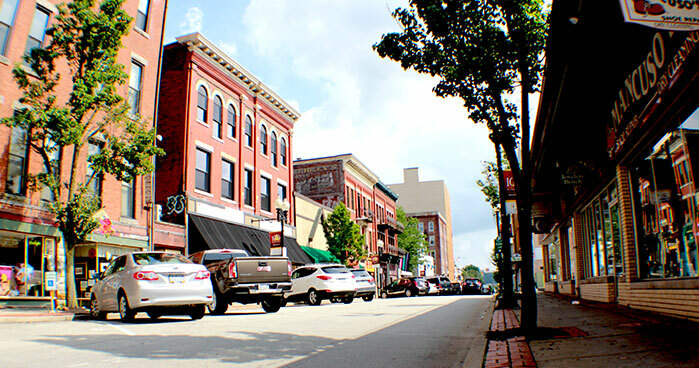 Taken in whole, these experiences are attracting visitors from Westmoreland County and the region to downtown Greensburg. Contained within a 4-block radius in the heart of downtown, the Cultural District features the Westmoreland Museum of American Art, the newly-renovated historic Palace Theatre, Seton Hill University’s new Performing Arts Center, and the beautifully restored historic Greensburg Train Station (still serving as an Amtrak station and also housing an upscale restaurant). A tree filled outdoor amphitheater is alive with music during the summer with the SummerSounds Concert Series. These institutions and landmarks are surrounded by art galleries, bookstores, cafes, performing art studios and restaurants. Downtown Greensburg is quickly gaining a reputation for an eclectic mix of food choices, offering everything from a quick bite to eat to upscale dining experiences. Dining in Greensburg is a unique experience with restaurants featuring sushi, southwestern, tapas, and traditional Italian favorites among the options available for visitors. Outdoor seating is prominent throughout the summer months, allowing customers to soak up the sun while enjoying lunch or dinner. After your meal, unwind at one of Greensburg’s coffee shops, or enjoy a craft beer or cocktail with friends at a local bar. Downtown Greensburg lights up after dark. The Cultural District offers music, theatre, and art performances and exhibits of every type all year round. After the performance, enjoy a glass of wine, classic cocktail, or craft beer while listening to a local band, participating in karaoke, or just enjoying good conversation with friends. Parking is free on the weekends and after 5 p.m. during the week. Downtown shopping provides a change of pace for those tired of crowded shopping plazas with a lack of personal service. A shopper in downtown Greensburg can purchase everything from a men’s suit to an original piece of art in the charming collection of shops and businesses that line the streets of Greensburg’s Shopping District. While the focus of the Shopping District is Pennsylvania Avenue, a stroll along both East Otterman and Pittsburgh Streets with family and friends will prove to be a unique and memorable experience. Convenient street, lot and garage parking is located within the City’s Cultural and Shopping Districts. As downtown Greensburg is an historic district, shoppers and patrons of the arts are surrounded by beautiful architecture, including that of numerous historic churches (look for the First Presbyterian Church on South Main Street, built in 1849, and the Otterbein United Methodist Church, built in 1857) and the stately Westmoreland County Courthouse. If you have a business that you believe would thrive in Greensburg’s Shopping or Cultural Districts, visit Business Opportunities or contact the Greensburg Community Development Corporation at 724-689-0040 or gcdc@thinkgreensburg.com.